Ann Romney, was born Ann Lois Davies, on April 6, 1949. If you follow politics and the recent presidential campaign, you probably know she is the wife of Mitt Romney. He is a businessman and Republican Party 2012 presidential hopeful. Ann was raised in Bloomfield Hills, Michigan. She knew Mitt in elementary school and he remembers throwing pebbles at her while she was riding her horse. Ann attended high school at Kingswood School, which was the sister school to Cranbrook, the preparatory school her husband attended. When she was 16, she began dating Mitt, who was two years older and a senior. They decided they might like to marry around the time he graduated in June of 1965. While Mitt was away in France for 2 and a half years as a Mormon missionary, Ann waited at home. She converted to the LDS (Latter Day Saints) church under the guidance of his father, George Romney. Before Mitt returned home, she had begun attending BYU (Brigham Young University). She dated another BYU student – Kim Cameron – and even sent Mitt a “Dear John” letter. He continued writing her and upon returning, was able to win her back. The young couple decided to get married in two weeks. When their parents objected to the hastiness of the union they waited and were married 3 months later on March 21, 1969. First in a civil union at Ann's family home in Bloomfield. And again when they flew to Utah the next day and had a wedding ceremony at the Salt Lake Temple. While Mitt and Ann were still undergraduates at BYU, they had their first son, Tagg, in 1970. She was 19 at the time and they were still living in a basement apartment. The couple had another son, Matt in 1971. During that time, Ann finished her Bachelor of Arts degree with two babies on her lap. They had three more sons, Josh in 1975, Ben in 1978, and Craig in 1981. Ann remained at home to raise them so that Mitt could pursue his career as a businessman, and eventually in law and politics. She supported him as he earned his degree in law, became active in the church, became an entrepreneur running his own companies, and eventually running for political offices. When Mitt became Governor of Massachusetts from 2003 through 2007, Ann had already been living with MS for almost six years. Ann Romney's diagnosis came just before Thanksgiving in 1998 after she had been suffering the year before with severe numbness and fatigue, among other symptoms. The diagnosis came as a relief of sorts, because she wondered if she might have Lou Gherig's Disease. She described her first year with MS as being horrible. "...The first year of the disease is horrible, because you just can't stand living with this cloud that's over you and that's sort of moved into your body." 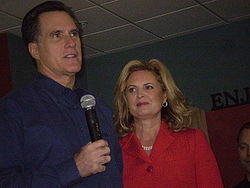 During Ann Romney's first year with multiple sclerosis, she was a very sick woman. "I was very sick in 1998 when I was diagnosed. I was pretty desperate, pretty frightened, and very, very sick. It was tough at the beginning, just to think, this is how I'm going to feel for the rest of my life. " The year after her diagnosis – February of 1999, her husband, Mitt was also trying to come to terms with what was happening to his wife. It was also the year he was overseeing preparations for the 2002 Winter Olympics in Utah. She was supposed to join him there in the spring, but the stress and loneliness of not having her with him was too much and he asked her to join him earlier. "I couldn't operate without Ann. We're a partnership. We've always been a partnership so her being healthy and our being able to be together is essential." Click here to go to Part 2 and to read about the alternative treatments Ann Romney uses.